PowerPoint’s Quick Access toolbar, located in the upper-left corner of the screen, offers three important buttons — Save, Undo, and Repeat. No matter where you go in PowerPoint, these buttons are ready and waiting on the Quick Access toolbar. However, you can put your favorite buttons on the toolbar and keep them within reach. And if the Quick Access toolbar gets too big, you can move it below the Ribbon. 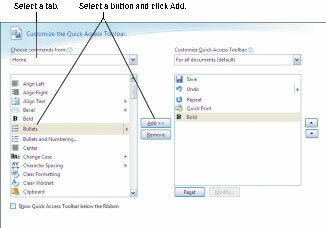 Right-click to add a button to the Quick Access toolbar. Right-click a button you want to see on the toolbar and choose Add to Quick Access Toolbar on the shortcut menu . Right-click any button or tab and choose Customize Quick Access Toolbar on the shortcut menu. You see the Customize category of the PowerPoint Options dialog box. On the Choose Commands From drop-down list, select the name of the tab with the button you want to add to the Quick Access toolbar. Then select the button’s name and click the Add button. Use this dialog box to add, remove, and reorder buttons. To restore the Quick Access toolbar to its original three buttons (Save, Undo, and Repeat), click the Reset button on the Customize tab of the PowerPoint Options dialog box.